Mansion Belle Oasis is Elegant and peaceful with a fantastic lanscape. To remain in compliance with local regulations our contract will be written for 32 days and prorate to the lenght of your stay. Mansion is located about 7 minutes away from airport, strip (MGM, New York New York, Monte Carlo, Mandala Bay...) or freeway to return to LA. The spirit is to make you feel at home 6 bedrooms and a casitas(extra 2 bedrooms), 5 bathrooms in the main building and 1 bathroom in the casitas own private gate, the driveway can fit about 30 cars and more. You will be amazed by the backyard, lot of trees, benches, walkway to enjoy the singing birds. Pool, Jacuzzi (heated with supplement 3hp 150usd/day), complete gaming room with ping pong table, foosball table, air hockey, basket ball hoop, pool table, professional poker table for your long fun nights. Flat screen TVs, gaming (WII U, Play Station 4) Direct TV and WiFi are offered. Work out materials available: body solid material, trainer(nordic track), free weights. We added a 2d large barbecue for big groups to share and a nice shuffle board. The mansion is so peaceful and spacious you won't believe you are in Las Vegas!!! Special request, feel free to contact us. We love vegas excitement, and we love to share precious time away from working days with family and friends. We want our guests to feel the same and work hard to make each stay memorable. Mansion Belle Oasis is truly a Gem in Las Vegas, a peaceful, gorgeous, modern place to enjoy your stay, something unique! Lanscape and outdoor are a must see. This house was PERFECTION. We hosted a 3 day summit (seminar training) with 90+ people. 27 stayed in the home. Perfect spacing, phenomenal customer service from property management as well as with the owners. Great neighborhood. Highly, highly recommend this place!!!! Thank you so much, we appreciate your time with us and you will be welcome for your next business stay. We held a large group event at this property and it worked well for us. We had a few issues with the heat but the management team was quick to respond and take care of the issues. We held a training class in the event center room and had over 30 people in the class. My only complaint would be the acoustics were not the greatest because of the lack of fabric and the noise from the jets was a bit annoying but there was really nothing that could be done. We're planning on coming back to this property next year. FABULOUS & SPACIOUS HOUSE, BEAUTIFUL GROUNDS, AMAZING STAFF, GREAT LOCATION! BEST WEEK EVER! My now husband and I rented this property for our wedding on 12/30/18. 42 people came from all over the country, and 24 stayed with us at the house. The house was beautiful and comfortable and the rooms were huge! There was plenty of room for all 24 of us to stay for the week, as well as the rest of our guests to come over for meals, the wedding, and just to hang out! My caterers cooked for us for 3 days in the well-equipped kitchen, and the two large dining tables offered plenty of room for everyone. It was a little chilly, so we couldn't enjoy much of the grounds, but for the wedding it was perfect! We rented some heaters for a cocktail hour by the pool, and the reception hall was ideal for a DJ, dance floor, bar & 42 guests! If you don't want to be on the strip, the location is perfect! There is an awesome view of the entire strip from W. Oquendo (best seat in the house for NYE fireworks! ), and it's right around the corner from grocery stores, etc., just 2 miles to The Orleans, a little further to In & Out Burger, 4 miles to the Strip, and a 15-20 minute drive to Freemont Street. We had a small issue with one of the toilets, and we had trouble regulating the heat in the larger rooms, but Natasha was on the ball and sent someone right away to take care of it! She and her husband were away for a few days over the holiday, but she was still available by text and responded promptly! In our rush to get to airport on our last day, I left my suitcase at the house and didn't realize it until I got all the way home to Ohio. I texted Natasha in a panic, and right away she found that one of the cleaning people, Nancy, found it and secured it in a closet for safe keeping. Natasha mailed it out to me the very next day, and I couldn't be more grateful to both of them! I planned my wedding from 2,000 miles away, and although I had a good feeling about all my vendors, you can never be 100% sure what you're going to get. I'm thrilled to say that all my expectations were exceeded! I hope I have the opportunity to stay here again! I have no words, I don’t know how to thank you for this wonderful review Natasha will be so happy to hear from you Quincy also. We wish you all the best and you are welcome anytime at your vacation home. Thank you so much for having fun at the Mansion. We were 12 adults staying at the home for a corporate offsite meeting. This home could not have worked better for our needs. The large, well equipped kitchen and island was perfect for cooking meals, and the living room and large dining table easily accommodated our group and served as a conference room for our meetings. The entire group enjoyed the stay and now think of it as home. As with any large home there were a couple of things that did not work perfectly (some things that were user error - our bad) but when we needed assistance, Natasha was always responsive to any questions or issues and things got addressed quickly - and I can't ask for any more than that. 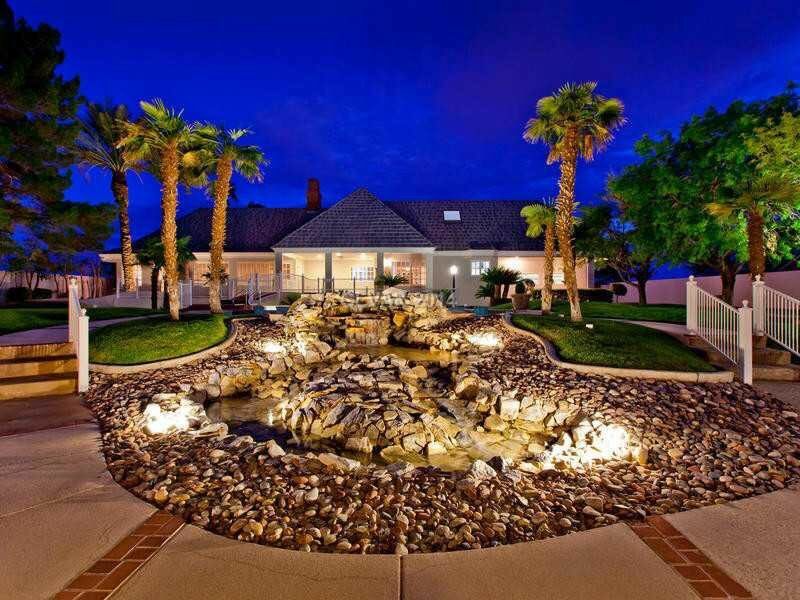 We loved your group and we also love to mix business and vacation home in Vegas. Convenient location to airport and strip. Well maintained grounds. Set up well for business meeting and socializing. Thank you so much for your business review and please come back anytime.